While perusing the endless aisles of CES this year I was more than excited when I happened upon the MyEdge booth displaying jacket s galore for the likes of the Nook, IPad 1 & 2, Kindle and other e-readers. After a quick talk with the Vice President of Marketing and Public Relations, Devon Mish, I knew this was a product that our viewers would love. 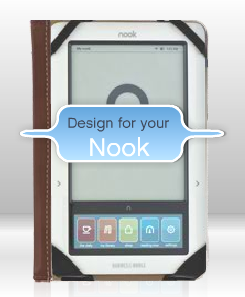 Like many of our followers, I am a Nook user and have been since November of last year, and while I loved my Nook I was growing increasingly tired of the fact that the only jackets I could find to protect it were either expensive, cheaply made, or had horrible designs. While my Nook is definitely a staple in my purse and daily excursions, I was growing increasingly tired of not being able to adequately protect its screen from the dangers of my purse and its population of pens, hairpins, etc. In fact, the weekend before CES I ventured into our local Barnes & Noble only to find that the only covers they had were poorly designed and cheaply made for a frustrating cost of between $40 and $50. I was so bummed that after spending a reasonable chunk of money on the product they were then going to charge me that much to protect it. I reluctantly gave up the search… until I happened upon the MyEdge Booth. The MyEdge Jacket is a jacket for Nooks, Ipads, Kindles and other e-readers that come in a variety of colors, designs, fabrics, and heck, on some you can even design your own cover with homemade designs or your own pictures(!). For this review I chose the MyEdge Build Your Own Jacket and found that while the company and website has a few quirks to work out, it was definitely the answer to what I had been looking for. The MyEdge Design Your Own Jacket is extremely well made; the cotton exterior is extremely sturdy, as is the entire jacket and the stitching is flawless. The inside fabric of the cover is extremely high quality for the price. The MyEdge Design Your Own Jacket looks better than any other cover you could buy for the same amount. Designing your own Nook or e-Reader jacket, even with the limitations mentioned below , is fun, unique and a huge bonus especially when compared with o ther covers that are more expensive. The price point is very reasonable, about $40.00 considering the high quality of the cover and that each cover is uniquely made with the design of your choosing. The website offers a variety of pre-made patterns but you can also upload your own patterns or pictures and choose a pattern for the front and picture on the back or visa versa. Furthermore you can write whatever phrase you wish on your cover and choose from a variety of fonts and sizes to display it in. You can even choose between brown and black for your spine color. The website is very user-friendly, easy to understand and effective. The website’s preview of what your custom MyEdge jacket will look like is spot on. Pictures put on the cover come out clear and crisp. This MyEdge Jacket not only protects your Nook while in a purse or backpack but it will also protect your Nook or e-Reader if you happen to drop it on the ground with its amazing and lightweight padding. Although a con is its weight, the MyEdge Jacket is still completely portable and personally, I’d rather have more protection for my Nook, with a little bit more weight than carry it around unprotected and have it be lighter. My Nook hasn’t gotten another scratch on it since I began using this cover, so it more than does its job. I assumed when I had first talked with MyEdge that the Design Your Own Jacket could come in a variety of orientations (for lack of a better word) with some flipping open with a stand or opening like a book. However, with the Design Your Own Jacket version of their jackets you can only choose the orientation that opens like a book. Also, the Design Your Own Jacket can only be printed on a cotton cover fabric, which wasn’t a con for us at all, but may be for some of our followers. The website to design your cover is it its early stages of development and running which means that it is a little bit slow at times. It also has a tendency to crash when uploading multiple images or photos of your own to test before choosing your final design, so when I designed my cover I needed to restart the process a few times before I picked the perfect design and everything went smoothly (although I have no doubt in my mind this is something MyEdge will correct once their website has had more experience and they fix all of its bugs). You have to be careful what designs and images you can put on your cover since copyrighted images will not fly. While this is completely understandable, it does limit the designing process to either patterns MyEdge has created for your use, your own unique patterns or your own images or photos that do not have any issues with copyright. While the MyEdge Cover is pretty lightweight itself, when combined with the Nook it does weigh about 1 lb 2 oz. Meaning that while it definitely is portable I find myself leaving it home if I know I won’t use it as opposed to carrying it around everywhere before just because it really wasn’t much of a bother, weight wise. While the MyEdge Design Your Own Jacket does have a slot to hold the e-Luminator light, it sits outside of the Jacket and does not get full coverage from the jacket like your Nook or e-Reader would leaving it subject to injury by random things inside or outside of a backpack or purse. Finally, while I have no problem with my MyEdge cover protecting my Nook and staying closed, it does not have a clasp on the Design Your Own version, meaning that while in my purse it is possible for items to slip in between the cover and the Nook and still do some harm (something I assume, also that they will fix in the future). Despite its cons, which I admit were a bit nit-picky on my part, this Jacket was everything I had been looking for in a cover for my Nook, and more. I strongly recommend it to anyone looking for a cover for their Nook, Kindle, iPad, or e-Reader because it is by far the best product you will find on the market for covering and protecting your choice of e-Reader. In addition to the MyEdge Design Your Own Jacket, we also reviewed and tested the e-Luminator Touch Booklight. One of my favorites about the Nook is the fact that it reads exactly like a book, meaning it’s not back-lit and won’t hurt your eyes after prolonged reading, however, this also means that you cannot read a Nook without light. The e-Luminator Touch Booklight is the perfect solution to this issue. The e-Luminator Touch Booklight is extremely lightweight and does not add any additional weight when using it in conjunction with the MyEdge cover. In fact it only weighs about one ounce. It has a plastic insert which makes it compatible with any of the MyEdge covers as well as regular books. The plastic insert is also very sturdy, meaning that it stays in its place once positioned. It it extremely flexible and can provide light in practically 360 degrees making it easy to illuminate your Nook or other e-Reader without having to deal with a glare from the light. It has three levels of light to choose from, all of which provide excellent illumination to your e-Reading device or book. I have even tried it in complete darkness and this light provides enough illumination to read your e-reader or book without hurting your eyes. It is touch activated which makes it easy to choose between the three levels of light and turn on or off. In the case it is activated accidentally, it does begin to flash within 20 or so minutes of use and will shut off automatically if you don’t tap it again. Although it is extremely flexible, it is very sturdy and will very likely hold its own against any other items it might find in your purse or backpack. It has very efficient battery life. It takes a single AAA battery so once the battery dies it is easy and extremely affordable to get a replacement battery, chances are you already have one lone AAA around your house (I know I do!). Even though it is a little pricey for a booklight (around $20.00), this is the only booklight you will ever need/want after you try it out. It is great for e-Readers or books and provides the perfect amount of light no matter which environment you happen to find yourself in. Since it is a touch booklight (meaning it is turned on and off by the touch of your finger) and the MyEdge Design Your Own Jacket does not adequately cover it, there is a tendency for it to turn on while in your bag or purse (although it does not remain on for long as it has an automatic shut-off in case it was accidentally turned on). Overall, the e-Luminator Touch Booklight and MyEdge Jacket is outstanding and we feel is priced competitively. The e-Luminator Touch Booklight makes a great addition to any MyEdge cover and even works great when used as regular book light. The MyEdge Jacket is impressively durable and more than adequately offers protection while giving your nook a stylish personal touch. In fact, we were so impressed with MyEdge products, we are excited to see what they will develop next for those of us looking to protect and equip our e-Reading devices!